Richard, not sure about the “simulation” argument. If a computer program simulates the function of a kidney, it needs proxies for the input and output of the kidney since the computer program can’t make urine. But if we posit that the input and output of the forebrain is “information” as transmitted by action potentials to and from sensory receptors and motor effectors, this does not pose the same problem as the kidney. the computer doesn’t need proxies for information, since information is what it does. So I don’t think Koch’s argument is convincing. Dan Pollen, a neurologist, reviewed the literature on frontal damage a number of times in papers in Cerebral Cortex. See for example Pollen, D. A. (2008). “The Fundamental Requirements for Primary Visual Perception.” Cerebral Cortex 18. And Pollen, D. A. (2011). “On the Emergence of Primary Visual Perception.” Cerebral Cortex 21(9): 1941-1953. His conclusion was that intact frontal lobes were not necessary for phenomenal consciousness. This is the same view as Koch’s and incompatible with what Hakwan is saying. Still, I think Koch should have said that his reading of the evidence is controversial. On why a simulation of a brain on a standard architecture computer would have very low phi: My understanding is that the fact that in the von Neumann architecture all information is funneled through a serial CPU precludes the integration required for significant levels of phi. Hi Ned and John, thanks for stopping by and commenting! Ned, I am aware of Pollen’s work (I actually invited him to be part of the PFC symposium I organized for the ASSC in San Diego but it didn’t work out) but my understanding is that it is based on a literature review (as opposed to examination of patients). That is not terrible but it should be weighted accordingly. And since then we have had updates…one thing I like about the Odegaard et al paper is that they published videos of patients that had only previously circulated informally (I had seen the videos previously because I emailed Bob Knight and asked to view them). The video of the patient with bi-lateral frontal lobectomy who exhibits akenitic mutism is extremely hard to asses. Does he seem to be having conscious experience to you? That is interesting re Von Neumann architecture, and I hadn’t thought about that before. Is there anything written on this? It seems the claim is that the computer itself has low phi? But what about the simulated system? “my understanding is that it is based on a literature review (as opposed to examination of patients).” Yes, but Pollen is a neurologist who knows how to read the papers. For example, he knows where the central sulcus is. “Does he seem to be having conscious experience to you?” I don’t think anyone can have any idea whether he is having conscious experience from that video. The problem with interpreting bi-lateral frontal lobectomy patients is that the operation destroys the cognitive capacities required for reporting so one doesn’t know what there is to report. But there is a way around that problem: look at varying degrees of frontal damage. Pollen’s point in those papers is that if you look at various different degrees of damage, the picture that emerges is increasing failure to be able to put together a response with increasing damage without any failure to perceive basic properties of color, shape, etc. I agree that there are two issues here. One is the question of whether bi-lateral lobectomy of the frontal lobes affects behavior in a significant way. It does and the traditional cases used to say it doesn’t are suspect (or that is how I interpret the evidence available). I agree it is hard to know what to say about the patient in the video but that is the point! A lot of people have said that removing the prefrontal cortex leaves people for the most part normal (Koch says something like their IQs improve and they go on with their life) and because of this it is supposed to be obvious that consciousness does not depend on activity in the prefrontal cortex (and that we have known this since the 1930s). This conclusion is not supported by the historical evidence (i.e. Patient A) or the current evidence (i.e. the kinds of patients examined by Knight in the video). That doesn’t establish the case one way or the other but it does establish that we shouldn’t make the kinds of arguments that Koch does (not to mention the way in which he asserts that IIT and Global Workspace are the two most popular theories of consciousness). Such capacities in humans are also preserved after extensive bilateral lesions of the prefrontal cortex (Brickner 1936; Damasio 1999). It might be argued that such lesions were not complete enough to exclude a role of these cortices, particularly the dorsolateral prefrontal cortex (Brodmann area 46), in PVP. However, that possibility appears remote given the sparing of the basic visual capacities of psychiatric patients following selective bilateral lesions of prefrontal cortex made with the intent to alleviate severe psychiatric symptoms without impairing the special senses (Heath et al. 1949). 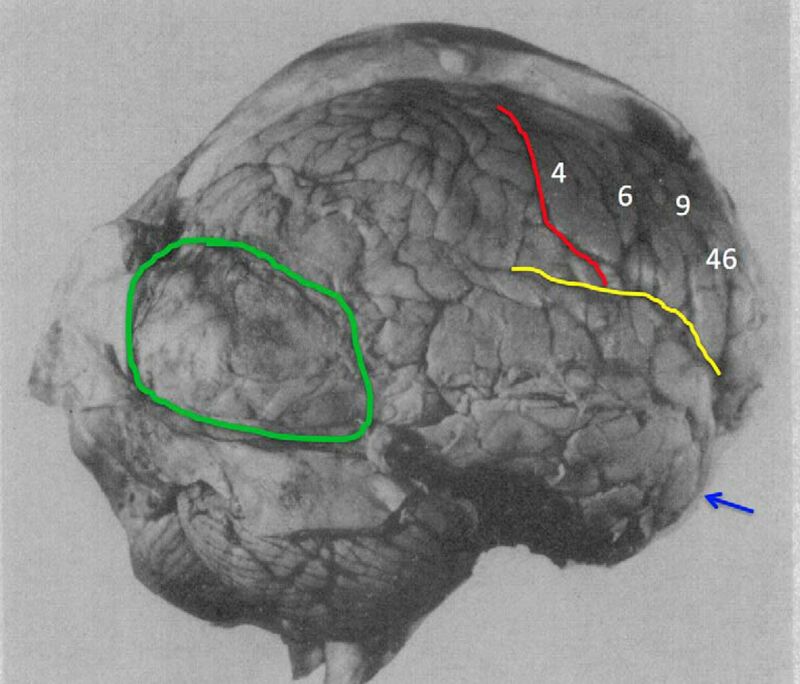 Bilateral prefrontal ablations were made in some subjects in Brodmann areas 45 and surrounding cortices, in others in areas 46 and surrounding cortices, and in still other subjects both areas 45 and 46 were bilaterally ablated. No bilateral ablation of prefrontal cortices disrupted basic visual experience for luminance or color and visual fields remained intact. Pollen may think the possibly that preserved prefrontal cortex can account for conscious phenomenology of these patients is ‘remote’ but that is based on reports from 1949 and some inferences from other data based on the assumption that prefrontal cortex is not required. But whatever the case about that isn’t this an empirical question? And don’t the arguments in Odegaard et al about this need to be addressed (whether you agree with them or not)? They present some empirical findings which support this ‘remote’ possibility. Pollen didn’t know about them in 2007 but Koch did. So, to the third, background question as to whether Pollen was right I would say that we don’t know but the argument should have progressed from historical cases to examination of current lesion data, etc. Hi Richard, very interesting piece. But I don’t understand the last point you made in the comment. Claiming that the computer itself has a low phi but the simulated system does not sounds to me like saying the human itself has a low phi but his system of thought is highly conscious. Hi Julia, I probably don’t really know what I am talking about but I was thinking that the simulated system (in this case the simulated brain) could be ‘cut’ in the simulation in the same way they do in the actual brain. So, if neuron A is connected to B and C in the simulation then we should be able to disable neuron A and see if any information in the simulated brain is lost, etc. (isn’t one of the goals of simulated brains to do this kind of specific lesion stuff? )…if so then phi could be estimated for it regardless of whether the computer itself had high phi.